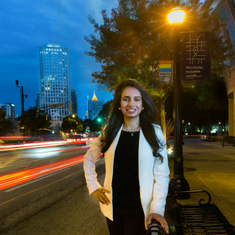 Maham Masood Sadiq worked with AT&T’s Smart Cities team to develop a model that quantifies the estimated CO2 emissions savings and economic benefits from its installations, primarily through Digital Infrastructure. AT&T’s Smart Cities team enlisted EDF Climate Corps fellow Maham Masood Sadiq to help quantify the potential environmental and economic benefits delivered by its installations. The project aimed to assist the company in achieving its 2025 Sustainability Goal, which calls for enabling carbon savings 10 times its own footprint. The Smart Cities team had identified qualitative societal benefits to cities associated to its installations, but had not yet quantified the CO2 emission savings. After interviewing team members across AT&T and identifying the potential impact of all smart cities products, Masood Sadiq decided to focus on Digital Infrastructure and its impact on cities. She developed a quantitative excel model that calculated the environmental and economic impact of the product and validated it through interviews and data collection from corporate ecosystem members and city officials. After determining from her internal and external interviews that it was essential to effectively communicate the results produced by the model to the target audience, Masood Sadiq developed a sustainability communications process flow for the AT&T Smart Cities team. Finally, she emphasized putting sustainability at the core of the AT&T Smart Cities business model and integrating her quantitative model into AT&T Smart Cities products. Masood Sadiq’s model estimated that a large-scale deployment of Digital Infrastructure in Atlanta alone could potentially bring economic benefit of approximately $144 million to the City of Atlanta and its citizens as well as save over 51,000 metric tons of CO2 annually. Moving forward, this work will assist AT&T in reaching its 2025 sustainability goal. Maham Masood Sadiq is a Sustainability Management graduate student at Columbia University. Her undergraduate training is in Electrical Engineering, but her research spans over innovative business models for renewable energy access in the developing world. Her work has been presented at the IEEE Photovoltaics Specialists Conference.